Manage your Mercedes PRO connect account and discover new services with the Mercedes PRO Portal. Mercedes PRO connect112 is the first of several Mercedes PRO solutions. It works harder to make the job easier - intelligently connecting fleet managers, drivers, and vehicles to increase the efficiency and productivity of your company in the long run. Be one of the first to start with Mercedes PRO connect – free of charge. Experience our welcome package and start right now. Innovative Components Build Better Solutions. 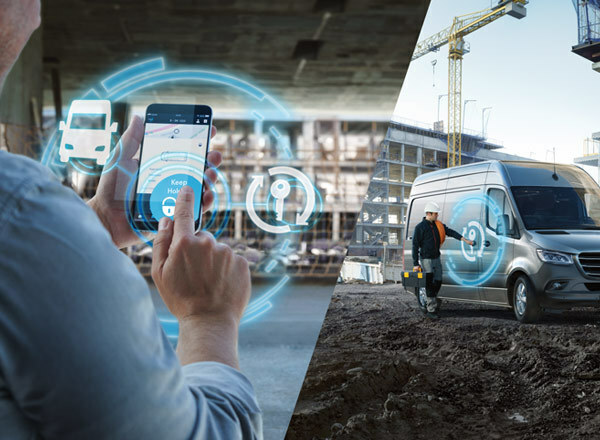 With the Mercedes PRO connect App, the driver can easily access valuable vehicle and job-related information. 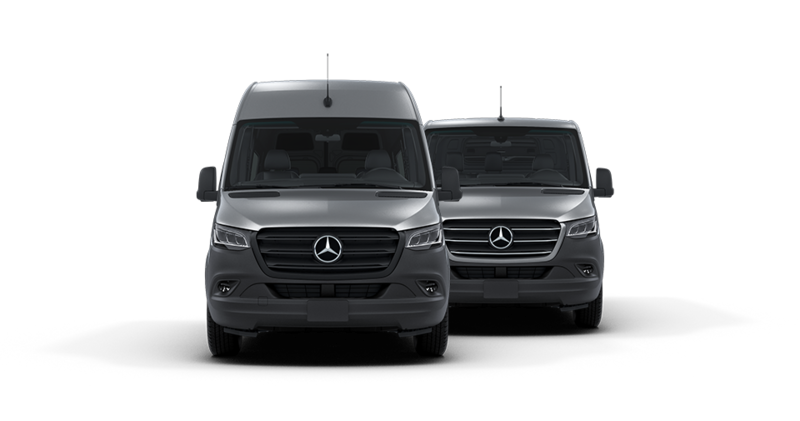 Standard in every new Sprinter, the Communication Module ensures the broadest range of connectivity from the start, quickly transmitting data with the permanently installed 4G LTE SIM card. 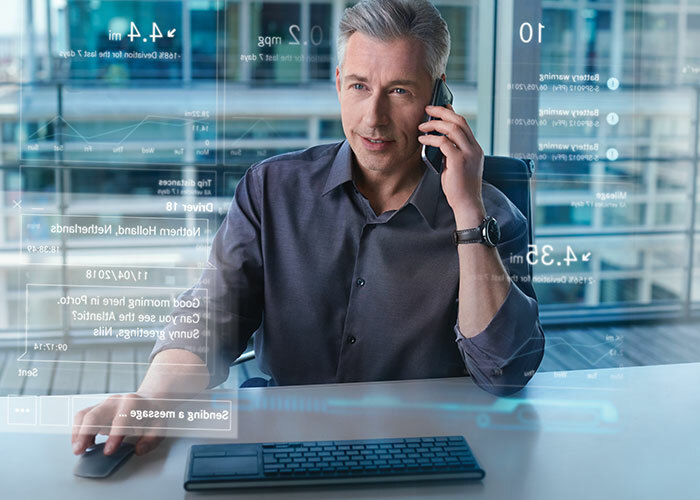 As the prerequisite for using Mercedes PRO connect services, the Communication Module makes your daily work even more efficient. 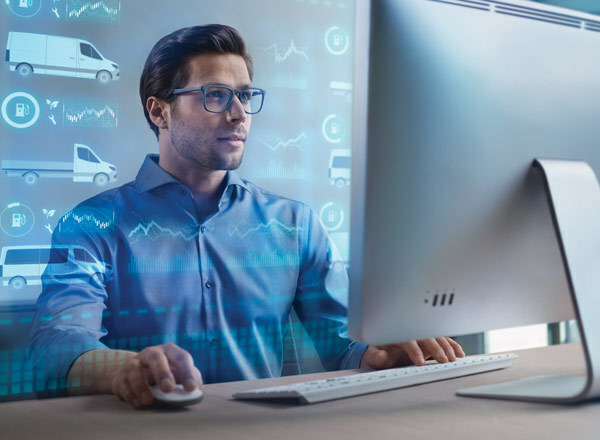 The fleet manager's customized hub of connectivity that provides a comprehensive overview of fleet resources - simplifying logistics and increasing productivity. 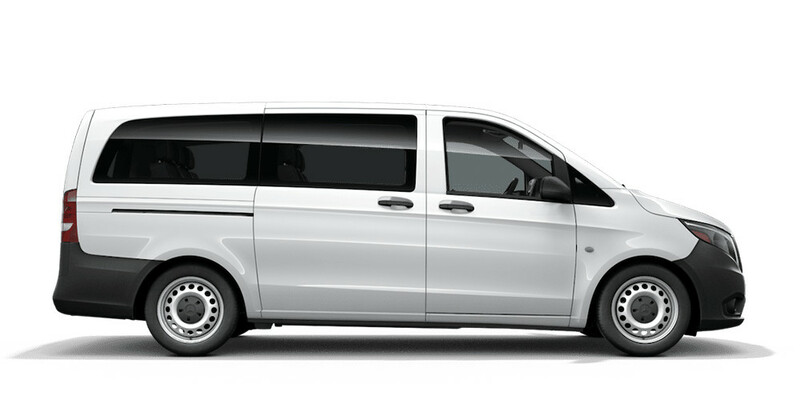 Integrate Mercedes-Benz Vans data into your existing fleet management system. Improve your overall work experience by increasing safety, improving navigation and route planning, as well as optimizing vehicle health. This bundle is complimentary for 36 months after van purchase in conjunction with activation of services in the Mercedes PRO Portal. Online Map Update122 ensures that maps are completely up-to-date; Software Updates119 guarantee the latest software version. Both services work with over-the-air technology. Navigation Functions123 and Live Traffic Information117 optimize navigation by real-time route and point of interest information. Multimedia Functions124 make work easier on the road with voice control, internet radio, and internet search. In the event of a crash, Emergency Call System116 automatically calls for immediate emergency response and sends the fleet manager important accident information. Request and receive immediate breakdown and accident assistance with Accident and Breakdown Management. Car-to-x-Communication118 leverages data from other vehicles to notify the rest of the fleet of hazardous conditions. Increase efficiency with a complete overview of your van and fleet from the Vehicle Management Tool. Digitalize your fleet through Remote Control. Simplify your business and replace physical log books with Digital Driver’s Log. Send specific locations to the vehicle's navigation system with Send2Car. In case of theft, Theft Warning130 sends notification and tracking information to the Vehicle Management Tool. Easily log and access trip information with Digital Trip Management, and export the digitalized information afterwards via Digital Driver’s Log129. Locate vehicles using geofencing technology and mark specific locations on the map for drivers with Vehicle Operations127. Use Remote Control125 to lock/unlock doors and control auxiliary heating from a distance with the Mercedes PRO connect App. Maintain a full overview of fleet and individual vehicle status with Vehicle Supervision126. Analyze fuel efficiency and consumption with Eco Monitor. 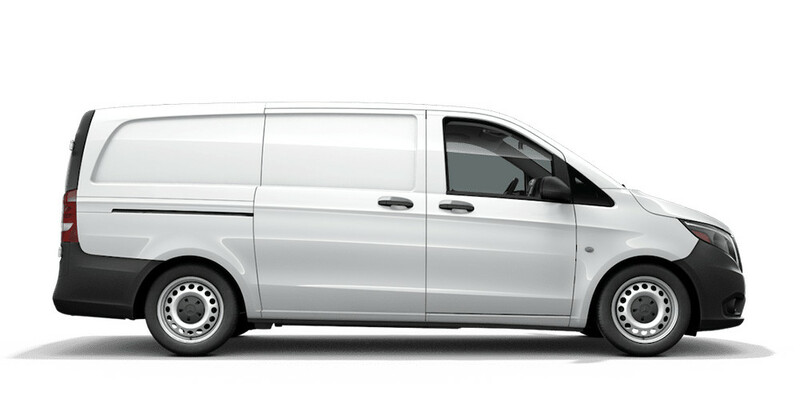 Integrate your Mercedes-Benz Vans' data into your existing fleet management software. Incorporate the extensive data available with Mercedes-Benz Vans into your existing vehicle management system with Vehicle Data Interface. The Vehicle Data Interface provides you various van related data points. YOUR ROAD TO YOUR CONNECTED SPRINTER. This is how you get started in The new Sprinter with Mercedes PRO connect. 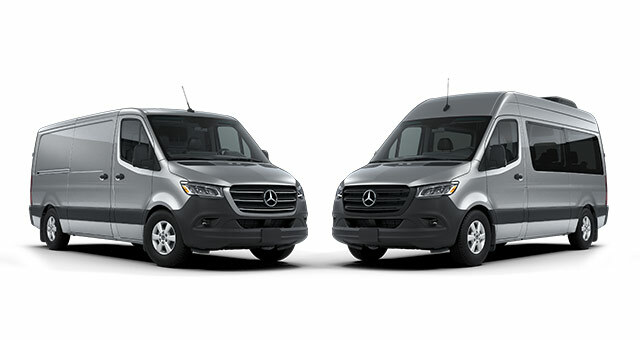 Do you want access to diverse connectivity and fleet solutions in your new connected Sprinter? 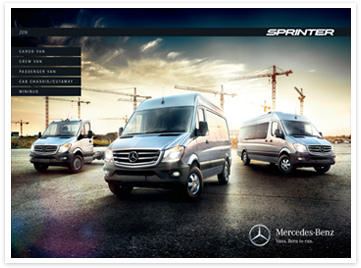 Discover the exciting, upgraded technology features in The new Sprinter. Manage your Mercedes PRO connect account. 112 Mercedes PRO is available for the Contiguous US, Hawaii, and Alaska with The new Sprinter (as from MY 19). 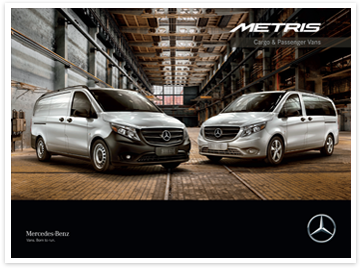 Contact an authorized Mercedes-Benz Vans dealership for more information. 113 In order to prevent distracted driving, the use of the Mercedes PRO connect App is not permitted while operating a motor vehicle in order to prevent distracted driving. If used while operating a motor vehicle, there is an increased risk of endangering oneself and others. Please follow your local laws and restrictions. 114 The availability of services in addition to the integrated Communication Module depends on the network coverage of the mobile network provider. The Communication Module (LTE) is not available in the US Virgin Islands or Puerto Rico. 115 After the Mercedes PRO connect go-live in The new Sprinter, there will be a Vehicle Management Tool for the factory equipped solution and Communication Module. 117 The information from this service is shown on the touchscreen of the multimedia system. Live Traffic Information can only be used in conjunction with the multimedia systems MBUX multimedia system with 17.8 cm (7-inch) touchscreen and navigation or the MBUX multimedia system with 26 cm (10.25-inch) touchscreen. 118 A valid subscription to Live Traffic Information is necessary to use Car-to-X Communication. Car-to-X Communication can only be used in conjunction with the MBUX multimedia system with 17.8 cm (7-inch) touchscreen and navigation or MBUX multimedia system with 26 cm (10.25-inch) touchscreen. Only the data of vehicles directly affected by the event and equipped with Car-to-X Communication are processed, therefore you may not always receive a timely warning of hazards through this system. 119 Update times, content, and installation times can vary. These are activated when the vehicle is delivered. Updates to the Communication Module (LTE) are automatic, as otherwise certain applications might no longer work. You can access the current status of the software versions in your vehicle via the Mercedes PRO Portal. 120 The wireless Internet in the Car is provided by AT&T and created via an integrated SIM card. A contract must be made with AT&T in order to access data services, and this contract can be made via the Mercedes PRO Portal or infotainment system. In addition to a data contract with AT&T, either an MBUX multimedia system with 17.8 cm (7-inch) touchscreen and navigation or satellite radio or the MBUX multimedia system with 26 cm (10.25-inch) touchscreen is required for the Internet in the Car service. Additional costs may apply depending on the amount of data used. 121 In order for us to offer you this service, data is transferred from the vehicle to Mercedes-Benz. This data includes the vehicle identification number, mileage, service code (A or B), as well as remaining time and mileage until the next service is due and information on the brake system and coolant. 122 The Online Map Update service is only available in conjunction with the MBUX multimedia system with 17.8 cm (7-inch) touchscreen and navigation or MBUX multimedia system with 26 cm (10.25-inch) touchscreen. The service must first be activated and the region for the map update selected in the Mercedes PRO Portal. 123 You can only use the Navigation Functions service in conjunction with the MBUX multimedia system with 17.8 cm (7-inch) touchscreen and navigation or the MBUX multimedia system with 26 cm (10.25-inch) touchscreen. 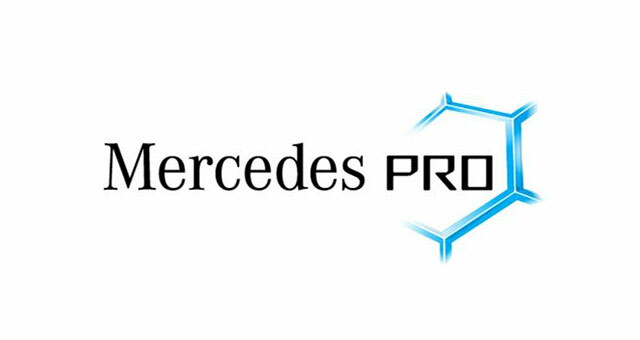 Before use, some of the applications must first be activated via the Mercedes PRO Portal. 124 You can only use the Multimedia Functions service in conjunction with the MBUX multimedia system with 17.8 cm (7-inch) touchscreen and navigation or the satellite radio or with the MBUX multimedia system with 26 cm (10.25-inch) touchscreen. Before use, some of the applications must first be activated via the Mercedes PRO Portal. For various functions (Internet Radio and Browser), additional data volume is necessary which can be purchased via the Internet in the Car service. 125 The Remote Control function via the Mercedes PRO connect App makes it possible for you to view the status of the doors and windows. The driver is also able to unlock the vehicle using a code via the Mercedes PRO connect App and also check the status of and operate the auxiliary heater. This function is only available in conjunction with an optional auxiliary heater (hot-water heater). 126 The available data can vary according to the vehicle model. The tire pressure can only be shown on certain model configurations. Display of the Ad Blue® level is only available in conjunction with the optional SCR Generation 3 emissions control. 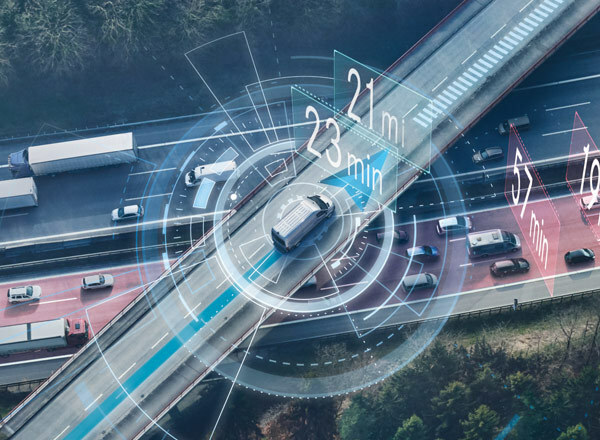 127 To safeguard the driver's privacy, he/she can switch off the vehicle tracking function via the Mercedes PRO connect App when making private journeys or travelling to and from work. 128 Messages from all drivers are visible to the fleet manager. Using the Vehicle Management Tool, he/she can, in turn, contact any driver individually with a message. If the Send2Car function is included in the subscription, a POI can be sent directly to the vehicle's navigation system. The Vehicle Operations service is additionally required to send POIs directly from the Vehicle Management Tool. 129 If you wish to use the Digital Driver's Log for your tax documentation, be sure to verify in advance whether the form and the information provided meets the fiscal requirements of your local tax authority. It provides two categories in which to categorize journeys: business journey or private journey. 130 The Theft Warning is shown in the chosen communication channel if the vehicle crosses preset geofences in a certain time period or if the optional Security alarm with interior motion sensor system sounds the alarm. Only in conjunction with the optional Security alarm w. interior motion sensor. 144 After expiry of the welcome package, your Mercedes PRO company account will remain valid and you are able to continue using the free products and services of Mercedes PRO connect in your Sprinter. To continue to benefit from the full portfolio of services, please note that the chargeable services must be purchased after expiry of the welcome package.